Publisher: Create Space Independent Publishing Platform, 2013. Slow Formation is the sequel to Gray, wrapping up Maggie's story and giving us some closure. Maggie is now a freshman in college, mourning the end of her relationship with Peter and wondering why she's "wasting" time in school when she already has a career lined up. She's trying to move forward but she's a little lost. She survives her first year and plans on spending her summer at home working with her Dad and learning the inner workings of the jewelry business. Life has other plans for her though and she earns an exclusive internship with an isolated remote expert in faceting jewelry. While there she comes to accept what and who she really wants out of life. The major characters from Gray return in the sequel, including Peter (John Doe) and Karns does a nice job of wrapping up their story lines. The beginning of the book starts out a little slowly and suffers a bit from "telling not showing" but once Maggie gets to her internship the story really begins to take off. 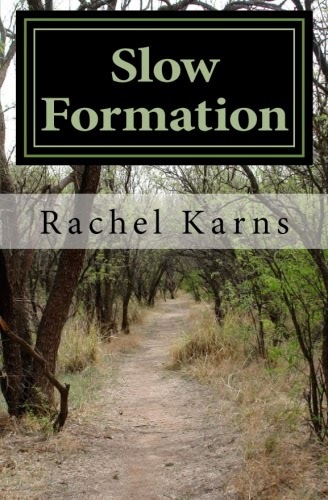 Karns has written an enjoyable heartfelt sequel that will make you smile as well as cry. Fans of the first book will not be disappointed.